After the latest Chinese military maneuvers, President Tsai Ing-wen on Tuesday said that Taiwan is not intimidated by China's military drills this week. Chinese activity was also denounced by a senior US official as "coercion" and a threat to stability in the region. "As you may be aware, China's armed forces yesterday sent a large number of military aircraft and naval vessels into our vicinity. Their actions threaten Taiwan and other-like minded countries in the region," Tsai said. "These actions only serve to strengthen our resolve. Our military forces have the capacity, determination, and commitment to defend Taiwan and not allow coercion to dictate our own future," she said. In response, China's People's Liberation Army said its warships, bombers and reconnaissance aircraft had conducted "necessary drills" around Taiwan on Monday, although it described them as routine. 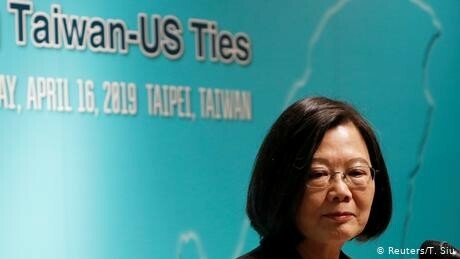 Tsai also said the Trump administration had notified Taipei of its third arms sale to Taiwan and the training of pilots at the Luke Air Force Base in Arizona. "It enhances their abilities to defend our air space. I want to express my appreciation to the US government for the announcement," she said. Tsai made her remarks at a forum co-hosted by Taiwan's Ministry of Foreign Affairs to mark the 40th anniversary of Taiwan-US ties under the Taiwan Relations Act, following Washington's decision to ditch formal recognition of Taiwan in favor of China in 1979. The event was attended by a delegation led by Paul Ryan, the former speaker of the US House of Representatives. Taiwan scrambled jets and ships to monitor the Chinese forces on Monday, its defense ministry said. The ministry accused Beijing of "trying to change the status quo of the Taiwan Strait." The People's Liberation Army Daily reported on Tuesday that the goal of the drills was to practice a "combined firepower assault" that included electronic jamming from aircraft under the protection of fighter jets. Bombers "screamed" towards the area and carried out "sudden attacks" while warships occupied assault positions and conducted attacks on "enemy" fire points, the official paper of China's military said. Landing forces reached specified waters, which were circled by helicopters at low altitude. The Liberation Daily newspaper cited a Chinese military representative as saying the drills were annual, planned exercises that were "completely within the normal legal rights of a sovereign country". China has repeatedly carried out what it calls "island encirclement patrols" in the past several years. Ryan said the US considers any military threat to Taiwan a concern and urged China to stop, saying that the moves were counterproductive. China has stepped up pressure on Taiwan and suspects Tsai is pushing for formal independence for the island. That is a red line for China, which has never renounced the use of forceto bring Taiwan under its control. Tsai said she wants to maintain the status quo with China but will defend Taiwan's security and democracy. The visit by US officials comes just weeks after Tsai said the United States was responding positively to Taipei's requests for new arms sales to bolster its defenses in the face of growing pressure from China. Washington sailed Navy and Coast Guard ships through the narrow strait separating the island from the mainland last month. It is all part of an increase in the frequency of US movement through the strategic waterway to show support for Taipei.